Attached is our entry for the GSD contest. Her name is Asti Spumonte Harlan. She is 16 months old and weighs 71 lbs. We have had her since she was 7 weeks old. Her purebred parents are owned by our daughter. This was the first litter for the GSD parents so my daughter insisted family members each took one of the pups so that she and her kids could watch them grow up. We have another GSD in our house that is about to turn 6. Picture attached shows the 6 year old lying on the floor. There was no great need for the second one. On one night out, we had a few glasses of champaign and decided another GSD would not be a bad idea and Asti moved in. She has been a wonderful dog with a very keen sense of what you are asking from her. Training is a breeze. 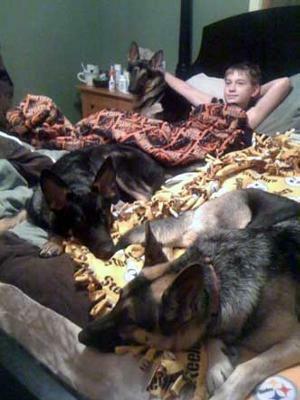 I threw in a picture of my 10 year old grandson Zachary, in bed with his 3 GSD's. The two black and tans are the parents of Asti. We are truly a GSD family.